Stillpoint's Oleander flower essence holds the energetic imprint of the whie, pink and magenta flowers of the oleander bush. The plants from which the blossoms came have been growing in our side garden in Sedona for 12 years. This particular flower essence holds the intention of happiness, brightness, and don't f*ck with me. Known as the Desert Rose. Known to signify the feminine face of God. 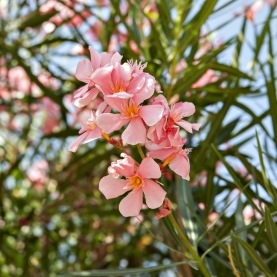 *Oleander is highly toxic when eaten however perfectly safe as a flower essence as it is completely vibrational. AlcheMystical Apothecary's Red Clover flower essence has an affinity for Rhodochrosite – they work well together. Amplifies intentions. Softens the “rebounds” in life. Gentle Guide. For when instinct is just out of reach, something is in place to protect you from attack. Desire. Sisterhood. Playful. Assists with Contracts & solidifying deals (having more confidence in your decisions/choices). Gives you the drive to move forward & inward to achieve goals. Assists with distancing yourself from the Collective by helping to discern what is yours and what is not. Trust in yourself and in the intuitive information that you receive. Connects you with the force that drives you. A sense of “carefreeness”, living in the moment, and not being affected by the “right thing to do”.